Freedom and Flourishing: Is Papua New Guinea a safe place for tourists to visit? Is Papua New Guinea a safe place for tourists to visit? My short answer – based on my recent two weeks holiday – is that it is safe for tourists to visit PNG, provided they take sensible precautions. As I wrote that sentence I was sitting in the terminal at Nadzab airport, fully aware that it had been the scene of a holdup by a group of 30 armed men a couple of months ago. I am not a particularly intrepid traveller, but I felt safe, given the number of people in the terminal – about 100 in the Airlines PNG area where I was sitting - with quite a few security guards not far away. 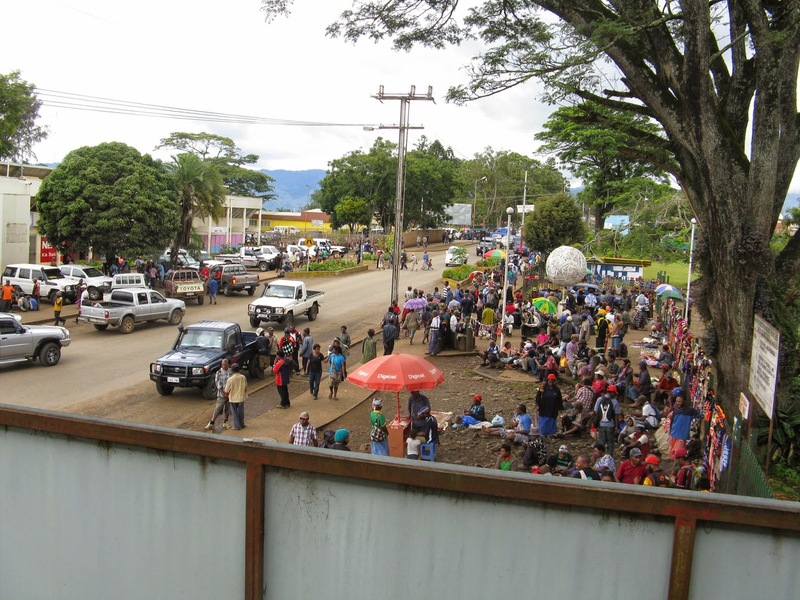 At the time of the hold-up, government officials claimed that Nadzab airport, which serves Lae - the second largest city in PNG - is not much used by foreign tourists. That claim is probably true. During the five hours I spent in the terminal I did not see many people who looked like foreign tourists. However, it seems odd to me that there are not greater numbers of foreign tourists passing through Nadzab airport. Lae seems to be well located to be a natural hub for air travel, as well as for land and sea transport. Perhaps the accidents of history which made Port Moresby the administrative centre of the country have impeded the development of Lae as a hub for air travel. My sojourn in the terminal at Nadzab airport occurred in the latter part of my visit to PNG. I spent a more enjoyable day looking around Lae earlier in my visit. 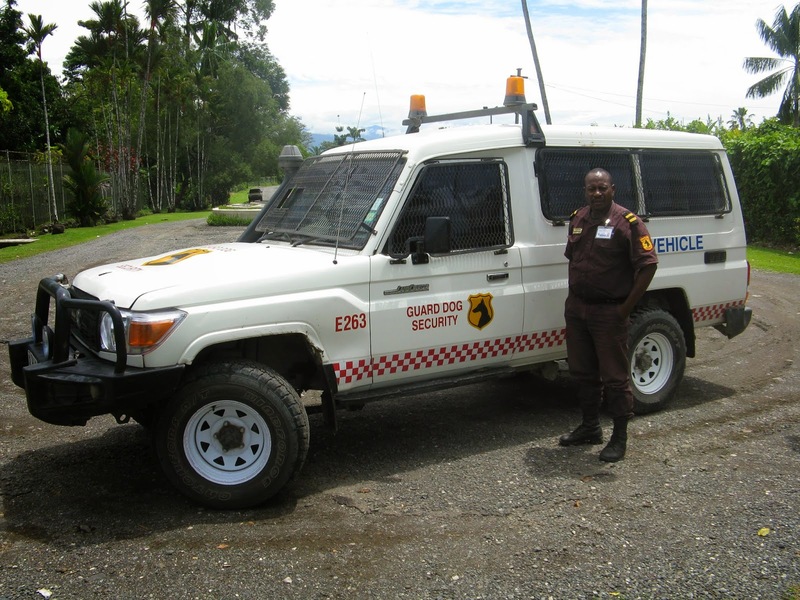 Of the places I visited in PNG, Lae is probably the least safe, but the security available there seemed more than adequate. The streets of Lae appeared to be quite peaceful through the grill on the windows of the Guard Dog Security vehicle that took me to and from the airport and around Lae. I had not expected any problems in finding a tourist operator to take me to places of interest to me in Lae. However, the operator I was referred to told me that city tours had been discontinued because tourists had become an endangered species. Reception staff at the Melanesian hotel arranged for Guard Dog Security to take me to the places of interest to me - the Lae War Cemetery and Rainforest Habitat - for a reasonable fee. 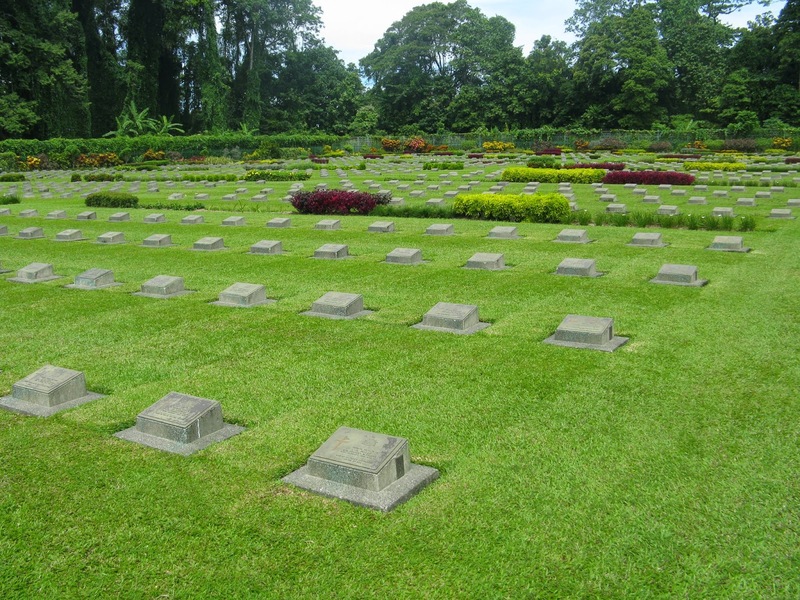 The war cemetery is well worth visiting, particularly for those, like myself, who have relatives who fought on the Kokoda track. The cemetery is well-maintained by the Australian government. At the time of my visit, there were no other visitors present. I was given a great deal of help to find the names of my relatives, but the lack of other visitors is a sad commentary on the state of foreign tourism in Lae. 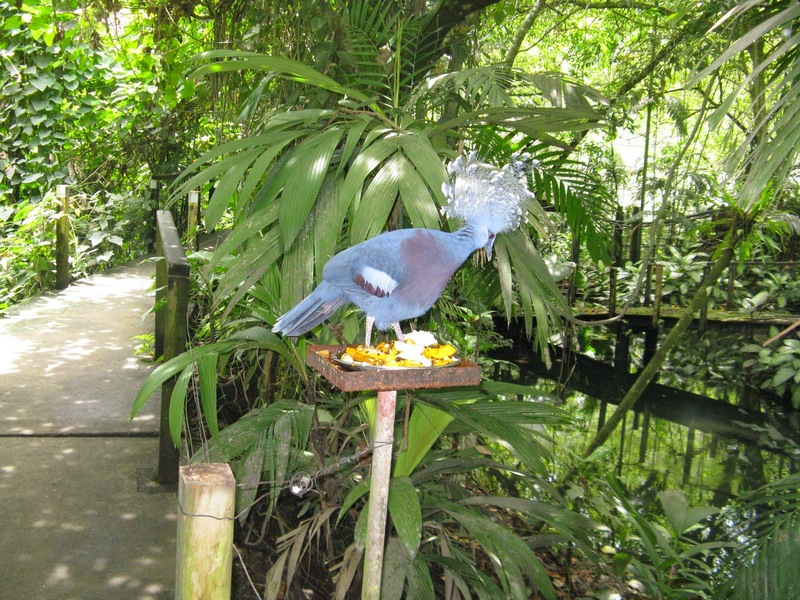 The Rainforest Habitat was worth visiting to see some of the local birdlife, even though I didn’t get to see a bird of paradise. The security man who accompanied me said that there had been more to see at the facility a few years ago. Apparently too few people are visiting to generate the revenue required for the facility to be properly maintained. While I was at this tourist attraction I think there was only one other visitor there. The other places I visited were Port Moresby, the capital, Goroka, in the Eastern Highlands, and Madang, on the north coast. Port Moresby is less safe than the other two towns. It is unsafe for tourists to walk around most parts of Port Moresby alone except within the boundaries of major hotels, modern shopping malls and other locations where security is provided. The same applies to local residents. Tourists are more fortunate than most of the locals because they can afford to be transported safely from one secure area to another. I had no hesitation in relying on taxis for travel in Port Moresby during my current visit. As a foreigner I had expected to be charged more than locals, but that didn’t happen when staff at Holiday Inn negotiated with the taxi drivers on my behalf. Disputes were avoided by negotiating the fare prior to travel and ensuring that the driver had change available for large notes when that was required. Tourist guides suggest that some taxi firms in Port Moresby are more reliable than others but, as far as I am aware, there is no taxi firm that is sufficiently safe to be recommended for women to use to travel alone at night. 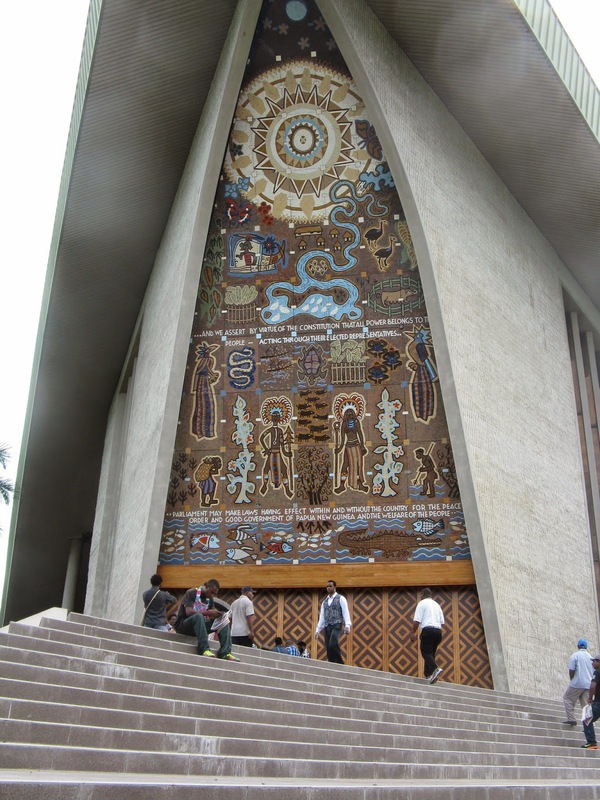 Port Moresby has tourist attractions that are well worth visiting during daylight hours, including the National Museum and Parliament Haus (see below). It is possible for tourists to visit these places without much risk to personal safety. When I arrived in Goroka, the bus from the Bird of Paradise Hotel was not there to meet me. Perhaps the plane arrived early. In any case, Peter Samuel, a young man whom I had just met on the plane, offered to walk with me to the hotel which would have been no more than a couple of hundred metres from the airport terminal. Peter saw me safely to the hotel, but as I was walking with him along the street shown below, the thought occurred to me that if I was advising another traveller in that situation, I would have suggested that they should ring the hotel and wait to be picked up. “Please, when you are in Australia remember me and give my phone number to one of the Australian Girl to get Courtship with me”. I don’t normally do this kind of thing, but if any young women reading this would like to get in touch with a young man from the Eastern Highlands of PNG, who has shown kindness to at least one stranger, I am willing to pass their phone numbers to Peter. 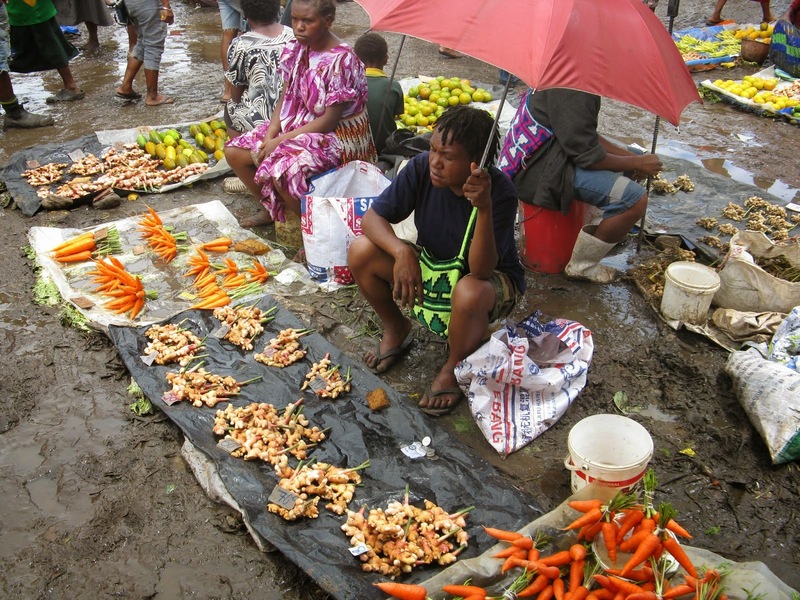 I felt safe walking around Goroka by myself, but obtained the services of a guide to visit a coffee plantation (which I will write about in a subsequent post) and to visit the Saturday market which is a short walk away from the town centre. I was impressed by the fresh vegetables on sale at the market. As in Goroka, I felt safe walking around Madang during daylight hours. I felt particularly safe walking around on my second day because a cruise ship, Pacific Dawn, was docked in the harbour for the day. It was particularly interesting for me to compare my experience wandering around by myself with the experience of a couple I met from the cruise ship. 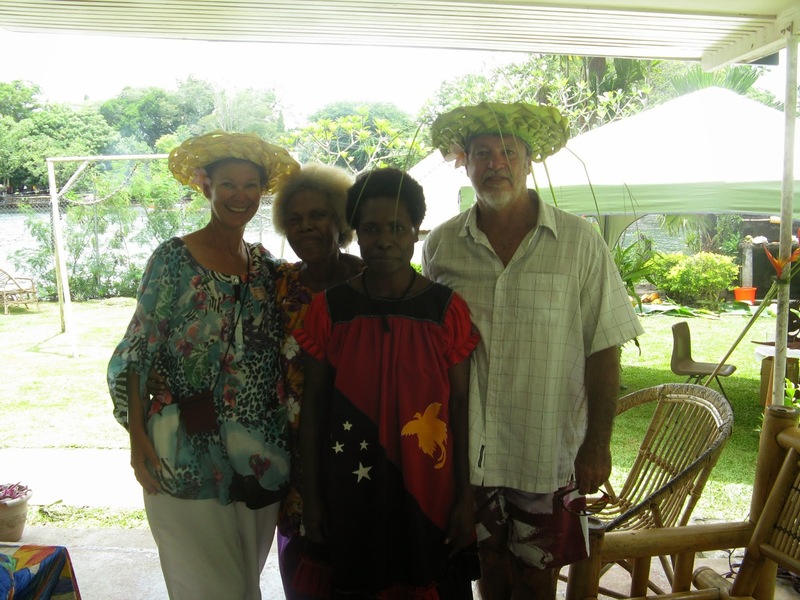 The photo shows Tania and Peter with a couple of ladies from the Country Women’s Association (CWA), who had just sold them some new hats. Cruise ships seem to be an ideal way for people to see coastal towns in safety and to experience organised sight-seeing and cultural experiences. The downside for people on the cruise ships is that they don’t get to see the highlands and don’t have as much interaction with local people. 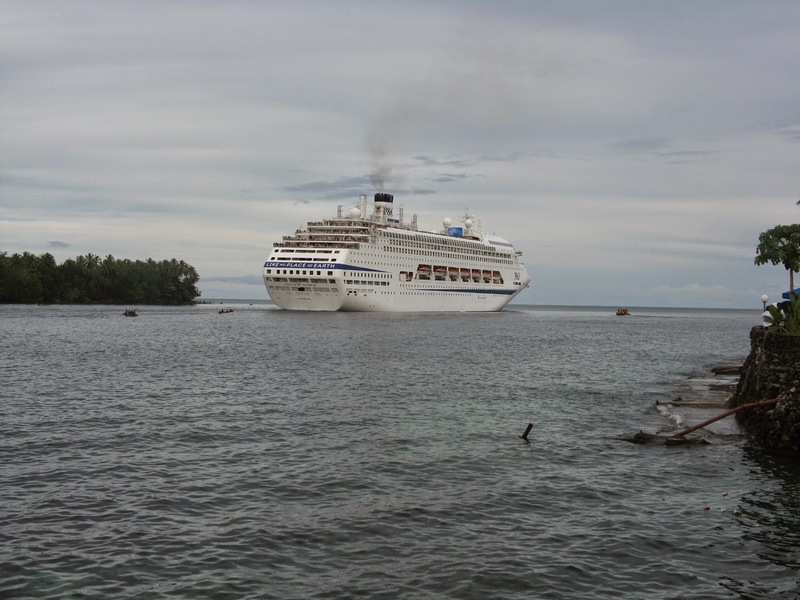 The photo shows the Pacific Dawn leaving Madang harbour. In my view the risks in organising my own itinerary to travel around PNG were minimal because I was able to stay in good hotels and to pay people to accompany me when necessary. Despite PNG’s reputation as a dangerous place to visit, many of the people I met went out of their way to protect my safety, as well as to make me feel welcome. Winton, its nice reading what you shared with me in Port Moresby in your blog from a hotel room in Cairns. Thanks for providing what I think is a balanced view of the attractions and the precautions that one has to take when they are considering to visit PNG or if they do make the trip. Thanks for your comment, Eric. greetings from tasmania.......google figbat oswald and see if you can work it out. Thanks for your sharing and please keep updating with your views.Your article is really very enjoyable while reading about PNG and please keep sharing more. Thanks for letting us know that it is safe to visit PNG. I think being in a resort that is globally known like Tawali Dive resort is a safe place for tourists. I think it is a safe place for tourists to visit.